The next time you eat your way to the bottom of a kimchi jar, save the juice and make Kimchi Micheladas. F&W's Kay Chun is on a mission to use kimchi in as many ways as possible. Follow along to see what happens. The next time you eat your way to the bottom of a kimchi jar, save the juice! All of that bright red kimchi juice that collects in the jar is liquid gold—fiery stuff to use for seasoning all sorts of dishes, like grilled steak, scrambled eggs and fried rice. 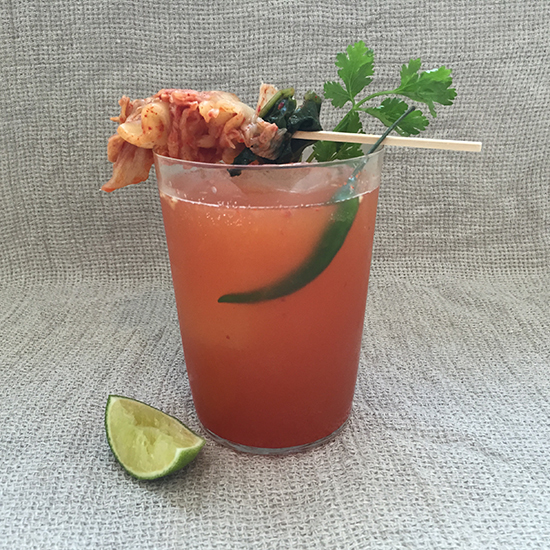 Another mouth-watering way to use the spicy juice is in Kimchi Micheladas. A fun twist on the refreshing Mexican beverage, they're perfect for hot summer picnics in the park or Sunday brunch. But be warned: They're so thirst-quenching and addicting, one is never enough. Make a pitcher and pass it around! In a pitcher, muddle the chile peppers with the lime and kimchi juices, then gently stir in the beer. Pour into ice-filled glasses. Garnish with kimchi skewers, cilantro sprigs and lime wedges.